Janome Magnolia 7318 sewing machine is the best choice not only for a beginner, but also for an intermediate user, thanks to its multitude of options provided at an affordable price. JANOME Magnolia 7318 is the perfect sewing machine if you are a tailor, it helps you do all your projects, starting from home decorations, crafting, quilting or garments. It is really easy to use because of its features and its functionality. These characteristics are universally viable for all Janome sewing machines, because Janome it is among the best manufacturers in this domain. It weighs only 17.2 pounds, and features 18 decorative stitches, a zigzag width control, and stitch length control. Because of its weight it can be easily relocated and carried. 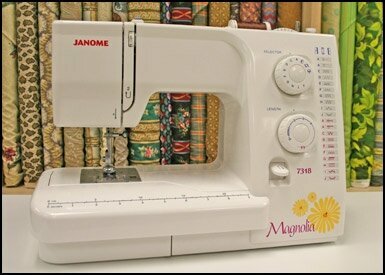 Janome Magnolia 7318 sewing machine is perfect for beginners. You should know that the Janome 7318 sewing machine is very versatile and it can be used not only for sewing, but also for quilting. When talking about fabrics, this Janome can be used on all kind of materials, no matter if they are very thick, have textured surface or are really smooth, like silk. The main difference between this model and the others is that it is a very quiet sewing machine, so if you are a mother and want to work while your children are sleeping, this one is perfect for you. It is well known for its performance and its powerful motor. The advantage of such a powerful motor is that it works at a high speed. The stitches are made at a very high quality, the process of stitching being adjustable, and the user can switch from a stitch to another. The thread of the stitches can vary up to 4 mm in length, and up to 5 mm in width. The stitches are perfectly straight. The weight of this Janome is one of its pros, because the 17.2 pounds make it easy to be moved and used it in different locations. Its weight makes it perfect for different sewing projects, as the ones from the school, church or for your group of women who love sewing. You can organize a sewing party and take it with you. You have the option of using it at a snap-on presser foot, or at an extra-high presser foot. The thread is easily to control and manage because of the thread cutter, the bobbin winder, and because it has the feature of manual thread tension adjustment. It is perfect for beginners because it is not computer-driven. This aspect makes it different from the other modern sewing machines, and makes it be a suitable version for custom creations. It has the drop feed on the back, so the user has to get up and adjust it. The accessories for Magnolia 7318 are not widely available, as are for the other models. Why is Janome Magnolia 7318 different? It has the bobbin set under the plastic cover, making it perfect for the busy seamstresses. This feature makes it easy to check how much thread is left without having to open the case of the device. It is not computer-driven, which can be considered an advantage because its user operates the electrical machine and its tools directly. The push and pull bobbin is really at hand to use and it has the presser foot higher than other models, which makes it perfect for sewing thick materials. Magnolia 7318 comes with 21 built-in stitches and the straight stitch center and the straight stitch left of center together as one stitch. Both the width and length of the stitch are adjustable and controlled with dials. You can select the stich by dial, having as options: fagoting, shell, knit stitch, arrowhead, blind hem stretch, knit stitch, overcasting, stretch overcasting, double overedge, bridging, thorn, zigzag, stretch zigzag, straight stretch. The sewing machine and all its parts are backed up by a 25 year warranty offered by the manufacturer just the same as the janome hd3000 model. Also, Janome provides phone and Internet support. So, a buyer of Janome Magnolia 7318 gets help no matter when his sewing machine has a defective functioning. The presser foot of Magnolia 7318 has 3 height settings: normal, up and industrial. It comes with 4 snap-on style presser feet: sliding buttonhole, blind hemming, zipper and general purpose. This Janome uses a box feed system which has a four piece feed dog. The machine can be used for embroidery, quilting or darning. The needle position can be changed from center up to 5 settings to the left. 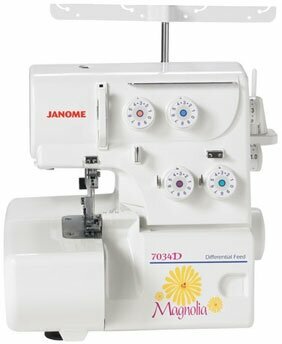 After using it many buyers go online a leave a Janome Magnolia 7318 sewing machine review. Their reviews are good and people are saying that it is an easy to use machine for the beginners. Others say that is quite durable and affordable to buy. It offers the same features as other sewing machine offer at a high price. She is most loved for its power, which allows its user to sew through fabrics as denim with no problem. One drawback of this machine is the location of the drop feet behind the machine, but the majority of customers are happy of purchasing this sewing machine. 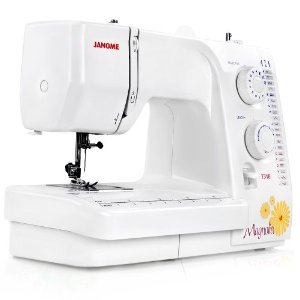 Because of its features and versatility Janome Magnolia 7318 is alongside the most favourite sewing machines for those who need an affordable sewing machine, suited to be moved from place to place.